In 1865, the iconic Matterhorn saw its first climbers ascend to its peak. 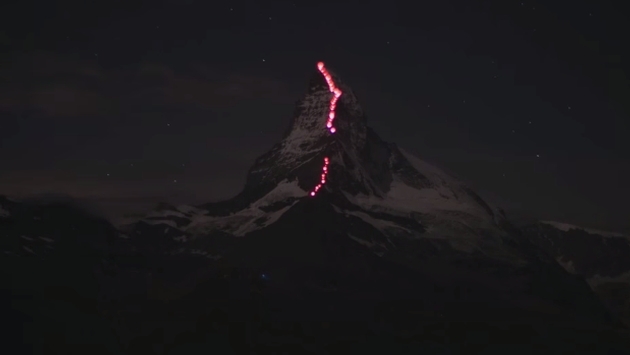 Nearly 150 years later, a croup of Swiss climbers once again scaled the mountain to literally light up the now famous trail. Gear Junkie (h/t Digg) posted the following video of climbers from Mammut, a Swiss producer of mountaineering equipment, climbing the Matterhorn with aims at producing a rather dramatic pre-dawn lightshow. According to the report, Zermatt is planning a wealth of events, including a re-opening of a beloved lodge. Photographer Robert Bosch was tasked with capturing the Matterhorn illumination, dealing with some cloudy conditions along the Hoernli ridge. In the end, the photog got his shot. Bosch offers, “I’m more than happy that we decided to try it again this morning,” referring to the two images of the Matterhorn lightshow, one with cloud covering and one with crystal clear conditions. Regardless of weather, the climbers and photographer teamed up to capture something truly brilliant, showing off the Matterhorn like we’ve never seen before.